Lately I've been becoming more and more lackadaisical about shaving. Partly because of the expense of razor blades, as I can be a terrible skinflint, partly because of the time taken to shave, and partly because of the shaving rash that makes it look like someone just tried to slit my throat. There are a few clean shaven guys at work, and quite a few more guys who can't seem to be bothered to shave either. I may have said on the odd occasion that I'm not one that can grow much of a beard. In fact it looks more like a hairy neck with a spiky anaemic goatsbeard. I kind of like stroking it when I'm pondering something at work, and only seem to shave nowadays when the stroking gives-way to scratching. 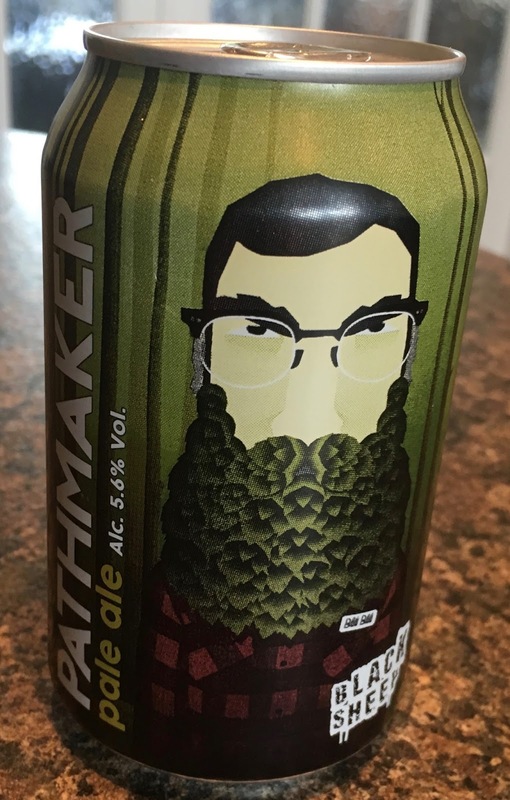 The hoppy bearded individual on the front of the can is the guardian of the North's hop and barley fields. He's let the Black Sheep Brewery in Yorkshire have some Chinook hops in order to make this Pathmaker pale ale. There is certainly a spiced herbal hop smell on opening the 330ml can. This 5.6% volume pale ale excitedly filled my waiting beer glass with a golden tint and a frothy head. On taste this beer is a treat to the tastebuds. The fresh crisp Chinook hops bash into the malted barley in the initial flavour, crisscrossing each other to begin with and then merging together into a refreshing bubbly bitter aftertaste. This beer is perfect for a Spring afternoon in the sun whether it's with a spot of gardening, or a good book and a deck chair. Enjoy!